Your website is the portal through which your customers, prospects, employees, investors and others interact with your company. We think ‘portal’ is a good term, because the site should allow you to publish new features and content as your needs change and as your company evolves. This Learning center tutorial will help you understand the basics of how a website works, so you can have a more meaningful conversation with your web developer. 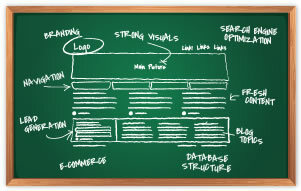 A website is a collection of related web pages that are designed to work together, and look like they belong together. Menus or links allow visitors to navigate through the site — that is, to see what’s available, and to display the pages that interest them. If you are planning a new website, one of the most important discussions you should have with your web developer is to plan the core content based on the goals for the site. For a business, this will generally include pages that describe your products or services, organized by major category. For a non-profit, it may be about your mission and events. The ‘Home page’ serves the same function as the cover of a book. It should make a strong first impression, welcome the visitor, provide a concise overview of the site. It should also provide an index that allows the visitor to navigate to the rest of the site. When viewing the Home page, a new site visitor should be able to tell in an instant if the website offers a potential solution to the problem he or she is trying to solve. Virtually every site should have a meaningful ‘About us’ section, which tells new visitors whether, and why, they should be interested in learning more about you. Additional pages may provide locations, contact information, terms & conditions, and anything else the visitor might need to know in order to work with your organization. In addition to static content, a website (remember the ‘portal’ idea) is also often used to deliver live business functionality directly to the customer. This might include an on-line ‘store’ (e-commerce) as well as more elaborate functions (think on-line banking, security trading, insurance applications and the like). To enable this kind of capability, one or more pages on the website accept input from the customer, and forward it to a system or application (computer program) for processing. This program may in turn access a ‘database’, which may include information about such things as the customer’s account and the products he or she orders. After processing is complete, output from the system is usually merged into a web page which is returned to the user’s computer via the Internet. The user’s browser then displays the web page, which may include the results of the transaction or request.